Engine leak: They start when combustion slips pass dirty piston rings. 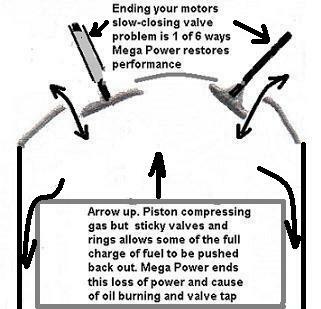 The product here free and clean piston rings as part of their leak stopping advantages. Vacuum leaks upset motor performance in older vehicles. Usually a warn rubber hose or device with a crack permitting air to be sucked in. Any air leak will greatly upset combustion or prevent it causing mis-fire. Replace with new. The engine may run rough. If you smell gas from the motor compartment, a few drops from a crack will smell. Check hoses and fuel lines for a wet look. Some hand heald devices can help locate the leak. Replace with new. Anti-freeze leaks often occur in the engine manifold., hoses, water pump, rarely by a engine head gsket failure. Acids are mostly the culprit. Sometimes a radiator sean will fail. See our radiator fush and stop leak, below. They can appear at a gasket, shaft seal, and head gasket. Acids from engine blow-by and oil breakdown usually harden and shrink gasket material annd seal. see out ad for oil leaks for thatr product. With time engines lose their vacuum. It is measured by a meter showing the amount of suction in a range from 0, meaning none, to 25 inches of vacuum. Your engine vacuum and performance is around 20 or more when its running at its best. And lowers as residues and friction builds. See our worm motor treatment for a product to incrase vacuum.